Carole Glasser Langille is originally from New York City, where she studied with such well-known poets as John Ashbery and Carolyn Forche. A poet, novelist, and children’s author, Langille is the author of three books of poetry: All That Glitters in Water (1990), In Cannon Cave (1997), and Late In A Slow Time (2003). In Cannon Cave was nominated for both the Governor General’s Award in 1997 and the Atlantic Poetry Prize in 1998. She has taught at a number of different programs and workshops, including the Humber School for Writing, Maritime Writer’s Workshop, and creative writing courses at Mount Saint Vincent University and Dalhousie University. Glasser Langille has also had her work translated into Spanish by Claudia Lucotti for the book Las Sagradas Superficies, Poesia Canadiense Actual de Lengua Inglesa, Una Mirada A La Vision Femenina, 2005 (Editorial Al/DVS, Mexico). Glasser Langille has received Canada Council Grants for poetry, non-fiction and fiction, as well as Nova Scotia Cultural Arts grants for poetry and fiction. 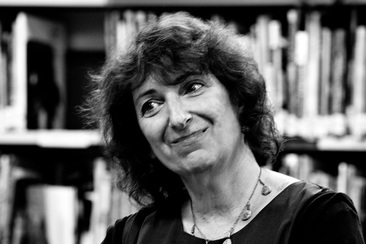 She was the 2011 Writer-In-Residence for the South Shore Public Libraries in Liverpool, Lunenburg and Bridgewater, Nova Scotia. She currently lives with her family in Black Point, Nova Scotia. Her fourth book of poetry, Church of the Exquisite Panic: The Ophelia Poems, will be published in the fall of 2012. Poem: "Her Kind For Anne Sexton"
you’re a good girl’ like a prayer before sleep. But there is some pain no love replaces. But not afraid to be blessed. is always seen for what she lacks. like a forbidden place, where secrets lie. and emptied, they become vases, bowls. Hollowed, they are more than themselves. nothing stays secret for long. are busy work. Training for a harder chore. we are given to love. until it disappears? Until we see who we are. You must have come to tell me things. you walk on. It's beautiful, so many stones. you'll be amazed how deep you'll go. You haven't yet told your story. Published in In Cannon Cave (Brick Books, 1997). Carole Langille could easily be typed as a poet of marginality who uses shore imagery to symbolize the border between life and death, self and other, personal and public. However, it is more accurate to call her a poet of liminality, of that mysterious verge where the perceptible becomes imperceptible. In the poem “Her Kind” – a putative dialogue between Langille and Anne Sexton – liminality evolves as the poem progresses. Initially, the living walk on land, while the ocean contains those in the afterlife. Poets, living and dead, haunt the shoreline (11-12); living poets only dimly perceive the dead, though the dead know the living thoroughly. Langille tells Sexton “A woman like you breaks a cup once it’s filled” (4), a metonym: Sexton is the cup that filled until she broke (committed suicide). Sexton then became part of “a forbidden place, where secrets lie” (13), a duplicitous use of the word “lie” as meaning both lie-in-state – like a corpse available for viewing (alluding to the confessional nature of Sexton’s poetry) – and as untruth. After death all mysteries shall be unveiled, so to assert a secret in that state is to lie. Langille’s poem then describes a woman who drills rocks from a tidal beach: “… emptied, they become vases, bowls. / Hollowed, they are more than themselves. /Anne, nothing stays empty, / nothing stays secret for long” (17-20). For all three women – Sexton, Langille, the unnamed craftswoman – creativity is a matter of becoming a vessel and then partaking of its filling and emptying. Sexton’s earthly creativity ends with her self-destruction, inserting falsity into the afterlife’s gnosis. Sexton, as ventriloquized by Langille, first says: “‘Under water, light moves differently. It bends, / unfocusing. It doesn’t / illuminate’” (22-24). Thus, Sexton observes that perception is altered after life. Her statement ends with “‘In ninety years you, and everyone you know, / will be dead. Then you’ll know / what I know now’” (29-31), reiterating that death, like water, abrogates perception, dependent as perception is on the boundaries of the physical body. However, Sexton asserts, there is something knowable beyond the powers of perception. In the end, Sexton becomes Langille’s muse, promising deeper understanding (36-40): “You haven’t yet told your story./ You called on me to tell you this / and I can: It’s time. Nothing will pull you under” (41-43). This exchange transforms the liminal shoreline trope to signify the boundary between time and its opposite: story. Sexton waits for Langille “at the portal of the cave” (31), a dual allusion to both the Oracle at Delphi, and Cannon Cave, which speaks as it is filled and emptied by the tide. Though Langille and Sexton never met on this side of death, in writing “Her Kind” Langille learns to tell her story. In “Her Kind” the image of the tidal shore transforms from describing the margin between creativity and death as a filling and emptying, through the liminal threshold between living perception and death’s incommunicable gnosis, to the threshold between gravid time, and mythic story. Langille, Carole. “Her Kind.” In Cannon Cave. London: Brick Books, 1997. 49-50. Print. Langille, Carole. All that Glitters in Water: Poetry. Baltimore, MD: NPS Inc., 1990. Print. ---. “Babi Yar.” Ed. Charles Adés Fishman. Blood to Remember: American Poets on the Holocaust. St. Louis, MO: Time Being Books, 2007. Print. ---. "Crows." Ed. Braid, Kate and Sandy Shreve. In Fine Form: The Canadian Book of Form Poetry. Vancouver, BC: Polestar, 2005. Print. 259. ---. "Elegy." New Coin Poetry. 49.2 (2013). Print. ---. “Her Kind.” In Cannon Cave. London: Brick Books, 1997. 49-50. Print. ---. “How I Got to Know Elizabeth Bishop,” June 21, 2010. The Elizabeth Bishop Centenary. Web. 9 Jan 2011. ---. "I Sat Very Still." PostCard Poems and Prose, postcardpoemsandprose.wordpress.com, 22 Dec. 2017. Web. 4 Dec. 2018. ---. In Cannon Cave. London, ON: Brick Books, 1997. Print. ---. Interview with a Stick Collector. Lockeport, NS: Roseway, 2004. Print. ---. "In the Prison." Atlantic Books Today, atlanticbookstoday.ca, 20 Sep. 2018. Web. 4 Dec. 2018. ---. Late in a Slow Time. Toronto: The Mansfield Press, 2003. ---. "Orange." Our Times. 32.2 (2013): 29. Print. ---. “Phone Survey.” Canadian Literature 161/162 (1999): 79. Academic Search Premier. Web, print. 27 Jun 2011. ---. “Poems.” Canadian Literature 161 (1991): 79. WorldCat. Web, print. 27 Jun 2011. ---. "Poems.” Canadian Literature 177 (2003): 11. WorldCat. Web, print. 27 Jun 2011. ---. "Praise." Antigonish Review. 2014.178 (2014). Print. ---. “Prayer.” Compton et al. Print. 135. ---. “The Sadness of Windows.” Compton et. al. Print. 138. ---. “Scanning an Afternoon in Winter.” Compton et. al. Print. 136. ---. "Stir." Canadian Woman Studies. 30.1 (2013): 102. Print. ---. “Through a Slit in the Tent.” Compton et. al. Print. 136. ---. “Too Late.” Antigonish Review 177 (2003): 11. Academic Search Premier. Web, print. 27 Jun 2011. ---. "Tree Man Was the Name You Gave Yourself." New Coin Poetry. 49.2 (2013). Print. ---. Tricky Traffic. Hantsport, NS: Lancelot Press, 1994. Print. ---. "Two Poems." Antigonish Review 166 (2011): 31. WorldCat. Web. 7 March 2012. ---. "Vin My Man." Antigonish Review. 2014.178 (2014). Print. ---. "What I Could Have Learned by the Light of Misfortune." Malahat Review. (2012): 53. Print. ---. “What the Gods Give Mortals.” Antigonish Review 152 (2008): 63-72. Literature Online. Web, print. 27 Jun 2011. ---. When I Always Wanted Something: Stories. Toronto: Mercury Press, 2008. Print. ---. Where the Wind Sleeps. Lockeport, NS: Roseway, 1996. Print. ---. Wild Bird. Perf. Barbara Budd, R. Murray Schafer, Ka Nin Chan, Kate Agnócs & Duo Concertante. Toronto: Centrediscs, 2010. CD. Compton, Anne, et al., eds. Coastlines: The Poetry of Atlantic Canada. Fredericton: Gooselane, 2002. Print. Haresnape, Geoffrey. "Psychological, Emotional and Spiritual Violence: Carole Langille's Church of the Exquisite Panic: The Ophelia Poems." Shakespeare in Southern Africa 29 (2017): 51-60. Web. ProQuest, doi: 10.4314./sisa.v29i1.5, 4 Dec. 2018. Lynes, Jeanette, ed. Words Out There: Women Poets in Atlantic Canada. Halifax: Roseway, 1999. Langille, Carole. Interview by Anne Compton. “Several Windows of Seperation: Carole Langille’s Poetry and Background.” Meetings with Maritime Poets: interviews. Markham, ON: Fitzhenry & Whiteside, 2006. 67-79. Print. Staines, David. "In Cannon Cave." Rev. of In Cannon Cave, by Carole Glasser Langille. Journal of Canadian PoetryL The Poetry Review for the Year of 1997 14 (1999). Print. ---. "Late in a Slow Time." Rev. of Late in a Slow Time, by Carole Glasser Langille. Journal of Canadian Poetry: The Poetry Review for the Year of 2003 20 (2006). Print.